Looking for the other kind of “green”? 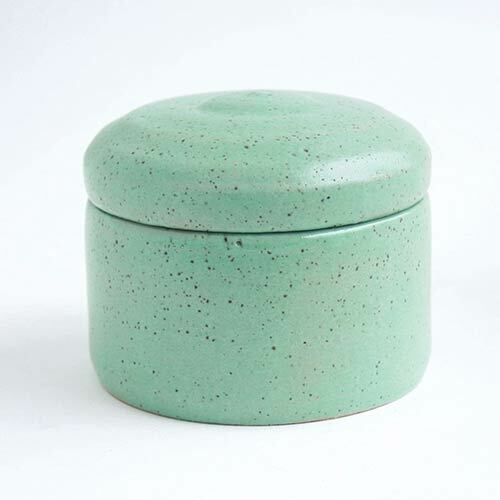 Check out this collection of eco-friendly and biodegradable urns. Perhaps she was into hiking, gardening, or the outdoors. Maybe he had a passion for “green” living and was a student of nature. 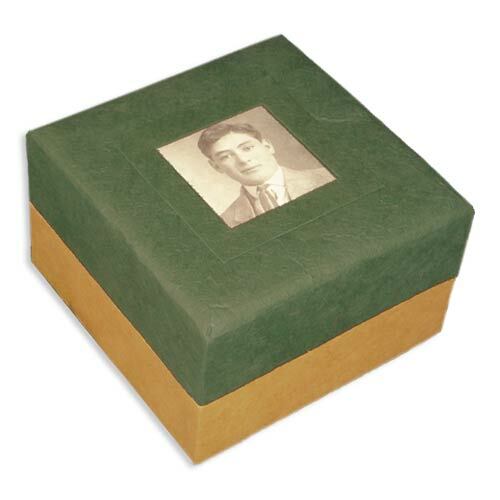 A green cremation urn might be just the right thing to perfectly – and symbolically – capture their zest for life. Green can also be a personal favorite color, or the team color of a sports organization or college. Or maybe it just happens to go perfectly with your decor. Whatever your reasons for choosing a green cremation urn, you will want the very best. 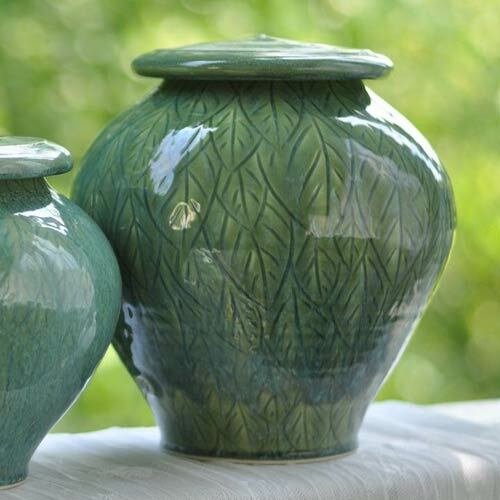 Below, we feature some of the most popular urns on the market in varying shades of green. 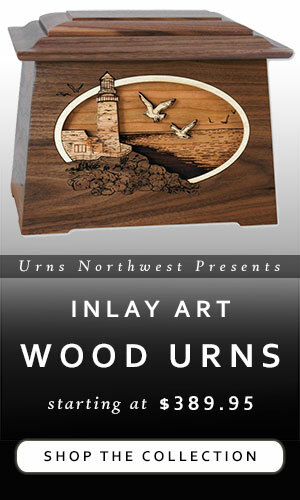 Several premium offerings are from our online store, Urns Northwest. Others are attractive and budget-friendly imports offered on Amazon, or perhaps something from a small artisan. We know you are just itching to read our full disclosure policy, but the upshot is that we have a financial interest in some of the products listed below that we sell, and on some others we may get a commission if you purchase something on our recommendation. Lastly, a note on prices – many prices will change over time or even from day to day, so we do not show pricing information. To see the actual current price of the item, click through to the seller’s product page. 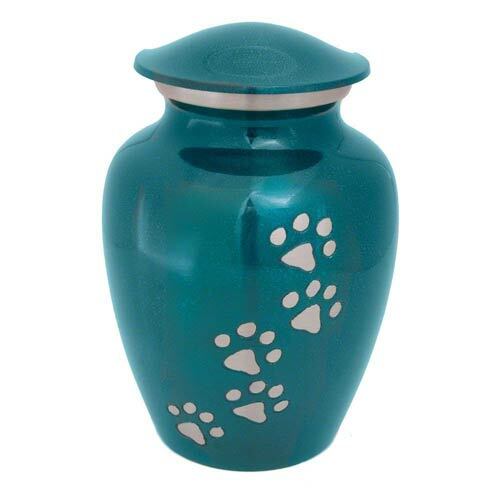 Please note that the green cremation urns for adults can often be used for larger pets, and the smaller urns for pets can also be used as a “keepsake” urn for humans when a portion of the remains gets scattered or shared among relatives. Looks like the leafy green canopy of a forest, doesn’t it? Complete with browns for the tree trunks and limbs and little hints of yellow sunlight and even a splash of blue sky. 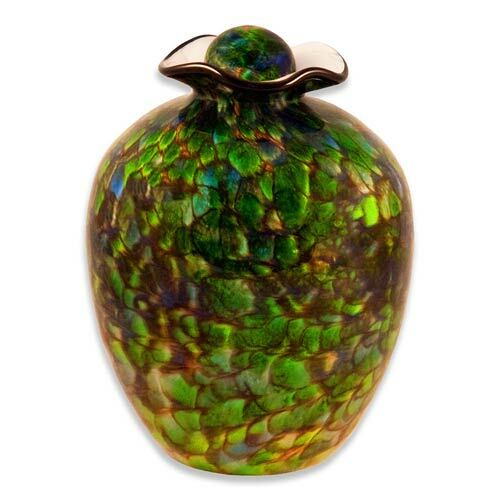 This green cremation urn is hand-blown in lovely colored glass. Each piece is unique, individually handmade to order in the USA and featuring a one-of-a-kind pattern of woodsy greens and browns. A true art deco memorial. 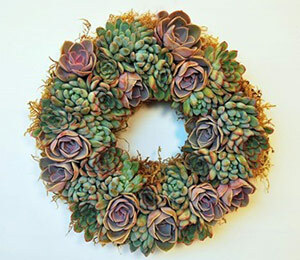 Same as the forest green urn above, but in a different color scheme. This, the “Aegean” finish, includes a whirl of blues, aquas, oranges, yellows, and sand colors in addition to the green. 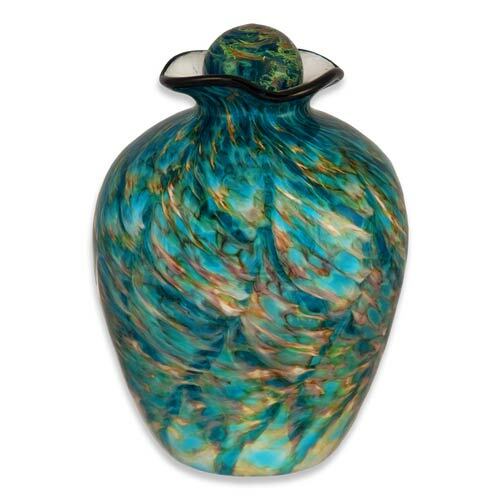 By far the most requested color scheme for our hand-blown glass cremation urns. 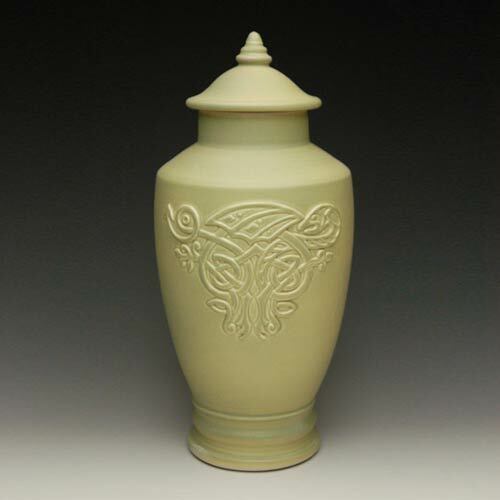 This green cremation urn is a beautiful ceramic art memorial piece that includes a space for a tealight or votive candle. Crafted in Bulgaria from cast ceramic forms, this sculpture permeates with life and vitality. There is a flat space towards the back of the urn center which is designed to hold a small tea light candle. 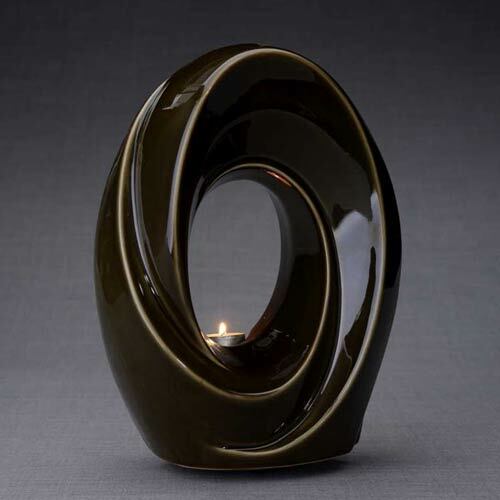 The oval shape perfectly compliments the candle flame, which burns in memory of your beloved. 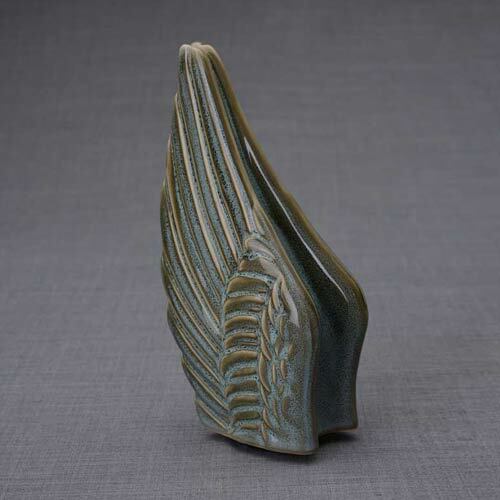 A new take on the traditional ceramic urn shape, this memorial art vessel features majestic angel wings and an “oiled green” finish. Also available paired with a smaller matching keepsake with raised angel wings lifted and about to take flight. 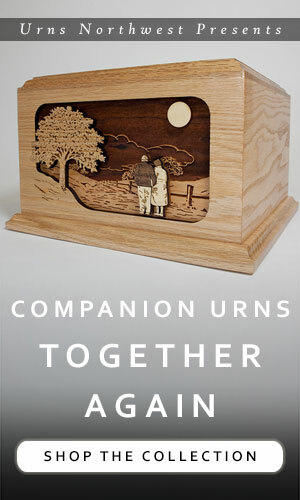 This stunning green cremation urn is handcrafted in the USA from small blocks of oak wood. The urn is then turned on a lathe by hand to create a beautifully classical shape that is very earthy and natural looking yet decidedly modern. Handcrafted ceramic urn in an antique, old-world style. The matted green finish overlays a raised Celtic dragon image. Individually made in the USA, with several sizes available. These include small, standard adult, and companion urn sizes (companion urns hold the remains of two people, often a husband and wife). This lovely little memorial is decorated with the outlines of leaves. 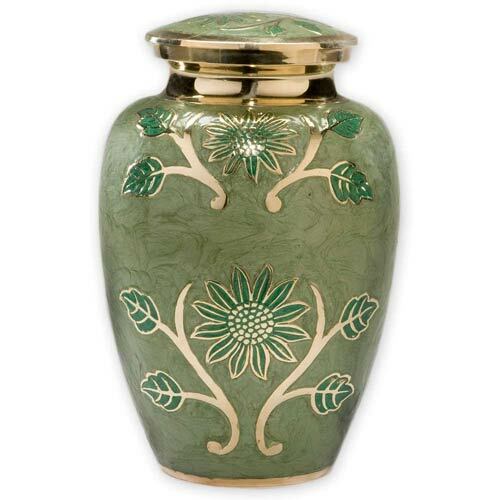 Made in Massachusetts by a talented ceramic artist, this green cremation urn features individually hand-carved leaf designs and a transparent glaze. A rich, dark, pine-tree-forest green, the Evergreen Cultured Marble Urn is stately and exquisite yet also emanates a sense of natural tranquility. Made in the USA, you can get this memorial custom laser engraved with an inscription, which looks excellent with a silver color fill. 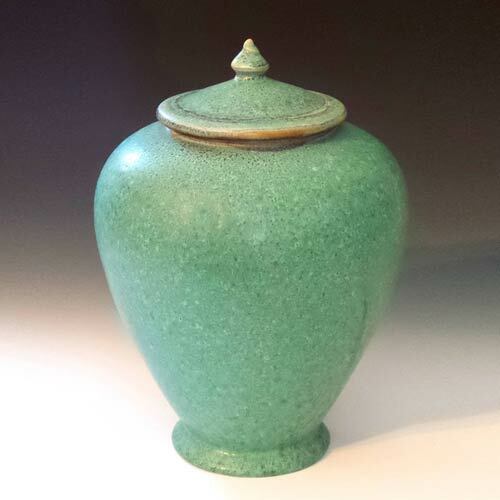 A lovely green ceramic cremation urn crafted in Socorro, New Mexico. This one is listed as a pet urn, but it holds 160 cubic inches of remains. This means that it holds ashes equivalent to 160 pounds of the original pre-cremation body weight. So it would work for anyone – adult or pet – who weighed 160 lbs or less prior to cremation. Since this is on the larger size, we’re listing it here as an adult urn, but of course you can use the same vessel for a pet. 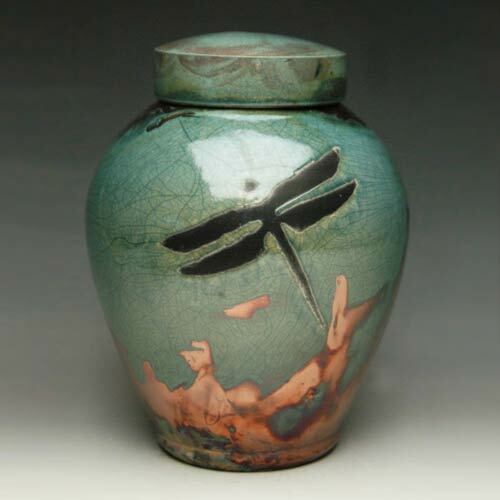 A gorgeous example of Raku-fired ceramics, this dragonfly cremation urn is bold, robust, and seemingly ancient. The finish is “Aqua”, but can range from bright blue to subtle green tones. This one shows some bright copper “flashing,” which is produced in unique patterns when the urn is fired in a combustion chamber. Also available in several other colors and sizes, including pet and companion urns. Handcrafted from start to finish in the USA at the hands of an artisan. This lovely biodegradable cremation urn is designed for spill-proof water scattering. 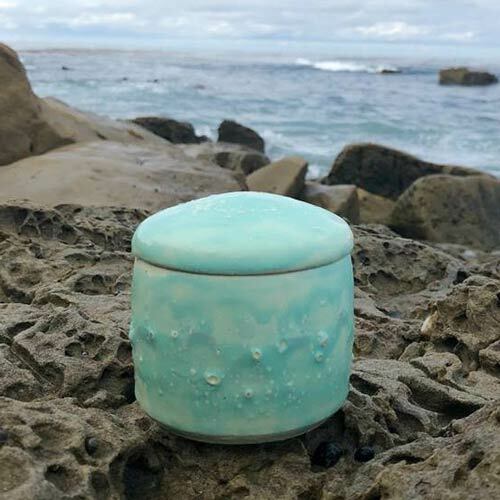 If you are planning on scattering your loved one’s ashes in the ocean, but are concerned about wind blowing the remains all over the place, then this is the urn you want. Crafted from natural biodegradable paper-based materials, this urn (available in standard and mini sizes, as shown above) keeps the remains completely secure. Just place the urn in the water and it will float for a few minutes then sink below the surface of the water, to slowly erode and cast the ashes throughout the sea. 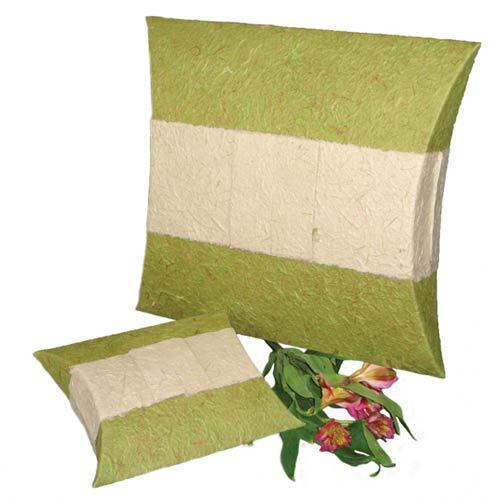 Another design in the “green” Earthurn series, this biodegradable urn features a square design and a photo frame to hold a picture of your loved one. Made from the bark of the mulberry tree, the urn is intended to be placed in the water for a water burial/scattering. Crafted individually in Canada (but ships anywhere), this stunning “Meadow” glass art urn features prominent splashes of green fields fading into a clear blue sky. 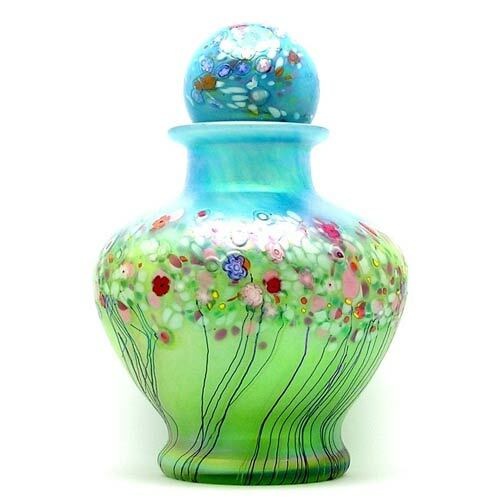 The urn is hand-blown in a sophisticated glass shape with what the artist calls “shimmering iridescent art glass,” and includes ornamental glass flowers and stems embedded within the surface of the urn, representing a vibrant meadow of flowers in gloriously full summer bloom. 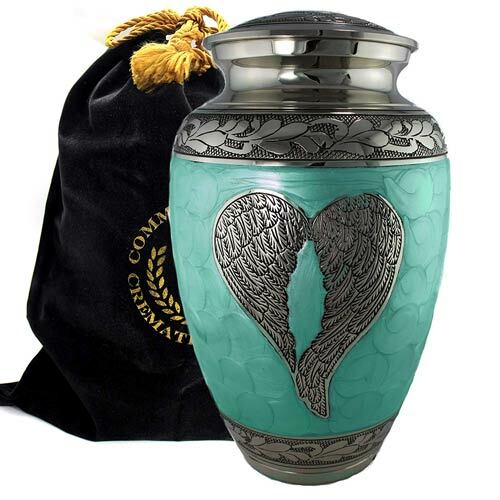 Mint green and heart-shaped angel wings are the prominent features of this elegant and affordable memorial urn. A traditional vessel etched by hand with timeless yet contemporary designs, this is a lovely tribute to your special angel. A weighty and durable brass urn with minimalist imagery of a flourishing flower garden at an affordable price. Standard adult urn size, with a 220 cubic inch capacity. 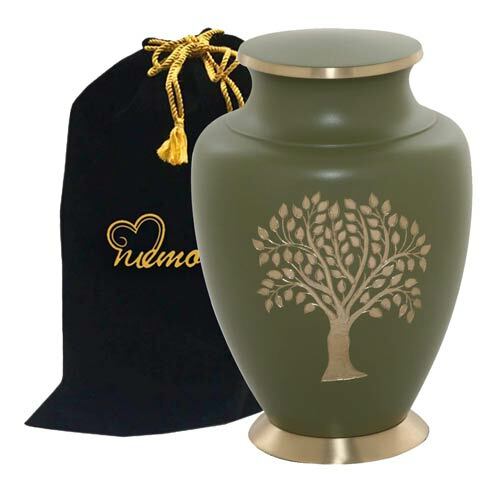 This brass cremation urn is a gentle solid olive green with gold accents. The smooth green finish highlights the golden “Tree of Life” centerpiece art design. Top opening with threaded lid, holds 200 cubic inches, priced for any budget, and includes the black velvet bag as shown. Another affordable entry in our collection of green cremation urns. The Azure Green Brass Cremation Urn is a light and airy green with a textured finish and ornamental silver and gold-colored brass accents. 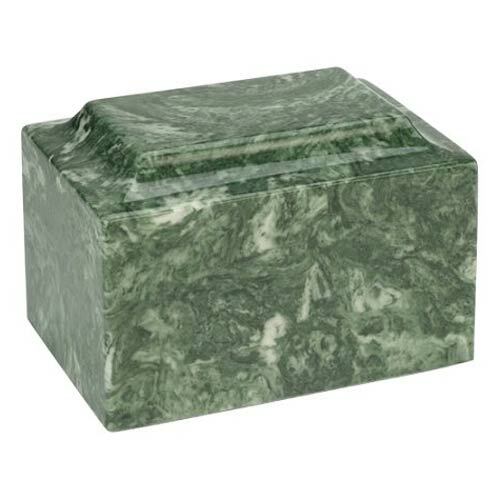 Colorful cultured marble cremation urn in emerald green, made in the USA. 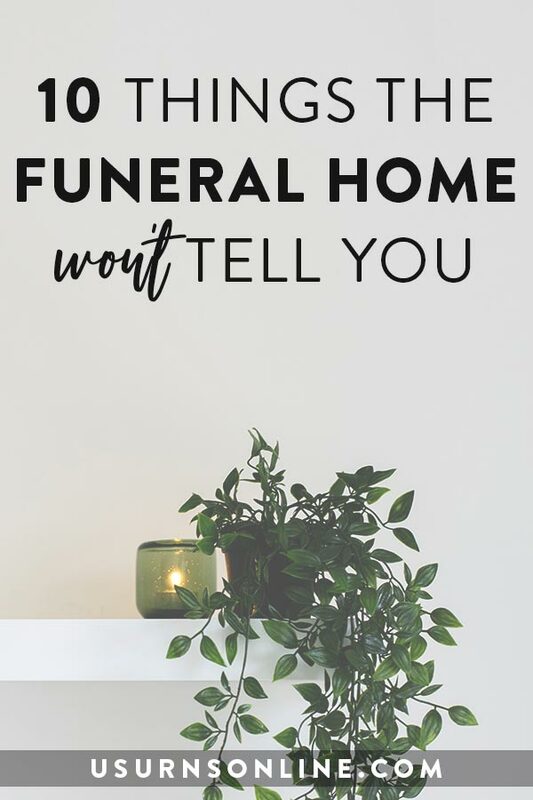 Completely durable and totally resilient, cultured marble urns can be buried in the ground without a protective vault or safely stored in a niche. 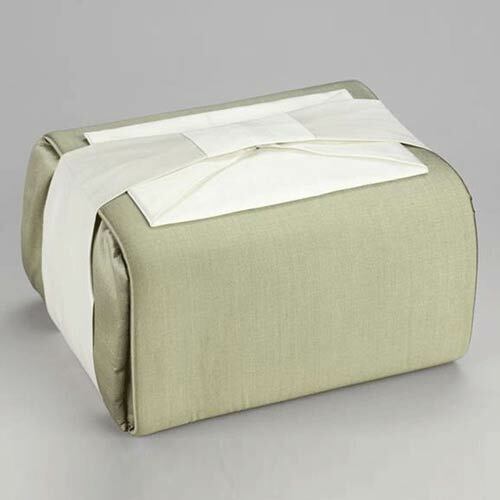 This fabric-wrapped memorial is a silky green cremation urn that looks beautiful and can safely pass all travel and airport TSA screenings. 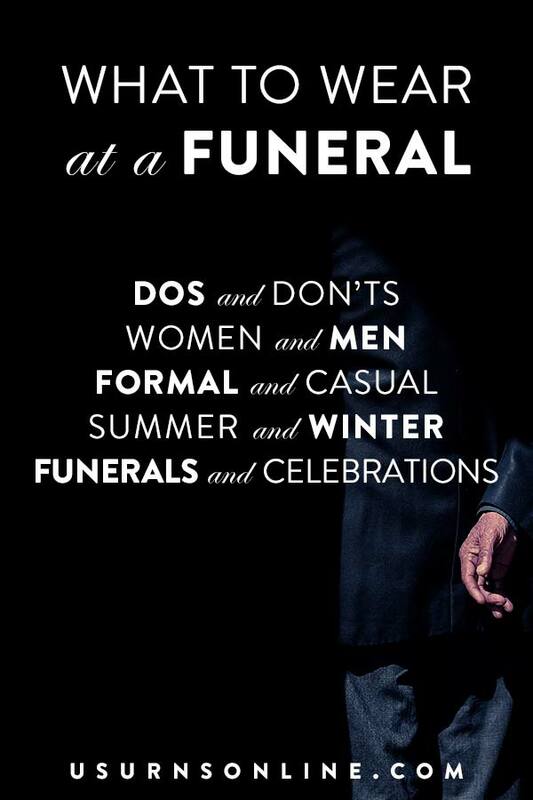 An ideal way to transport your loved one’s remains with dignity and grace. 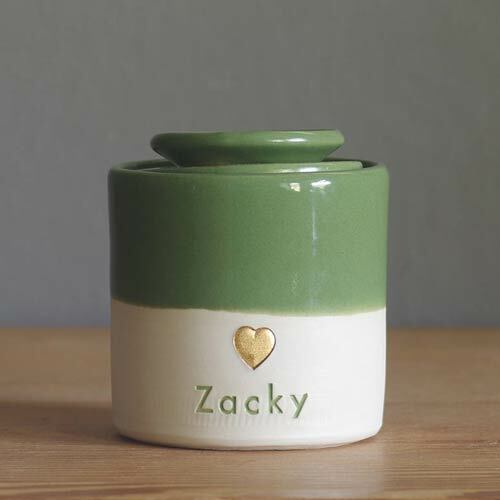 A cremation urn that can truly be described as “adorable.” This green and white ceramic jar vessel is handcrafted and includes your pet’s name beneath a simple heart. Available in many sizes and colors with some selection on personalization. A one-of-a-kind urn handcrafted in Portland, Oregon. 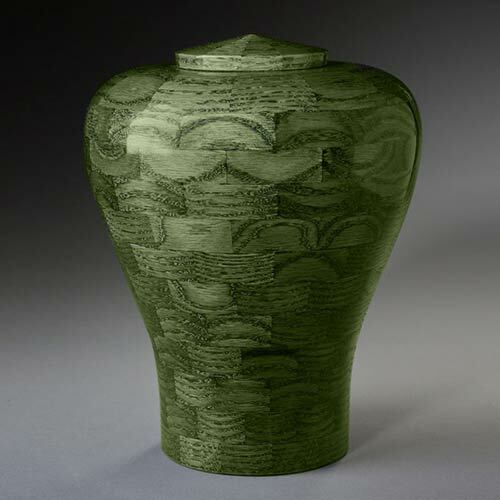 Glazed stoneware pottery urn in spotted jade green. A very tiny urn for the smallest pets or a keepsake portion of remains saved after a loved one’s scattering ceremony. Very natural looking, this urn is handmade in New Mexico. 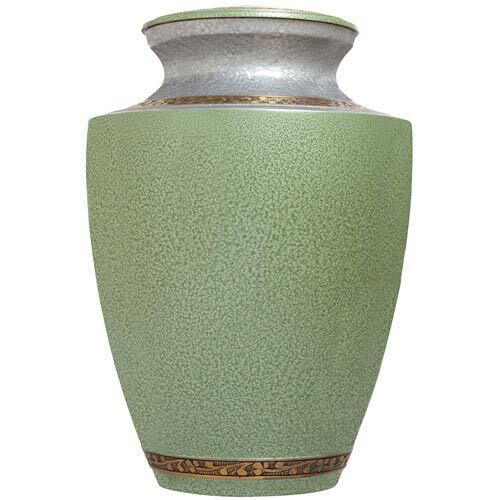 This small keepsake or pet cremation urn is crafted in ceramic and boasts marvelous oiled green melange finish. 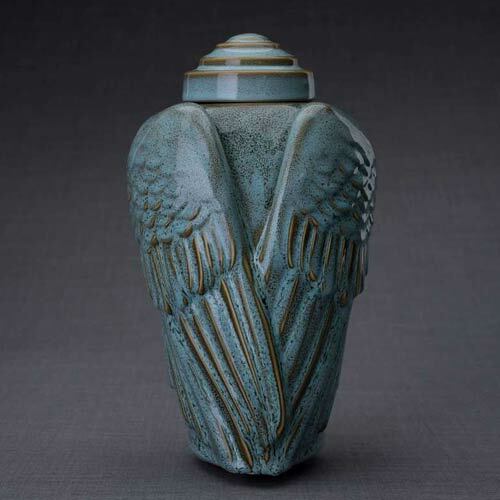 Shaped like a pair of raised angel wings, the urn gives the effect of an angel about to take flight. Popular, simple, affordable, and green. This pewter pet urn comes in multiple sizes and finishes. Pictured above we showcase the green finish (after all, that is what this article is about! ), but there are also many other colors. These include black, brass, slate, raku, and more. Clay stoneware with a brilliant crystalline glaze. 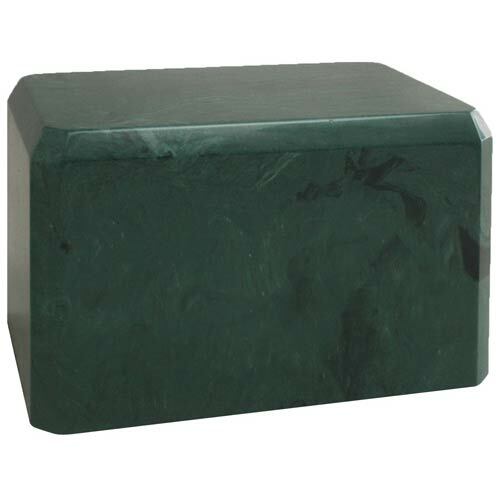 This gorgeous green cremation urn holds a spacious 135 cubic inches of remains, so it is suitable for a large pet or as an urn for a human at 135 lbs or under (or when part of the remains are scattered or shared). 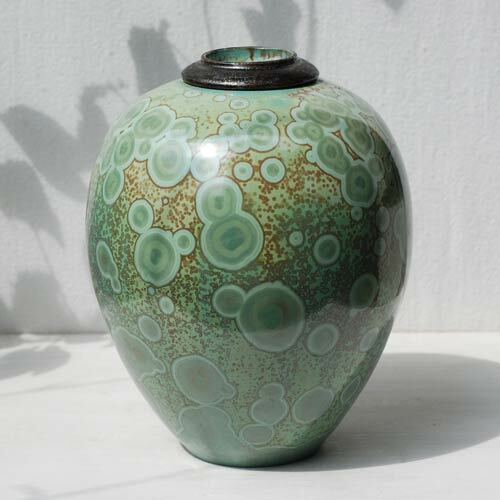 This bubbly-green urn’s design comes from the crystalline glaze process, which is very difficult and involved. The final effect is a stunning finish that is decidedly one-of-a-kind. 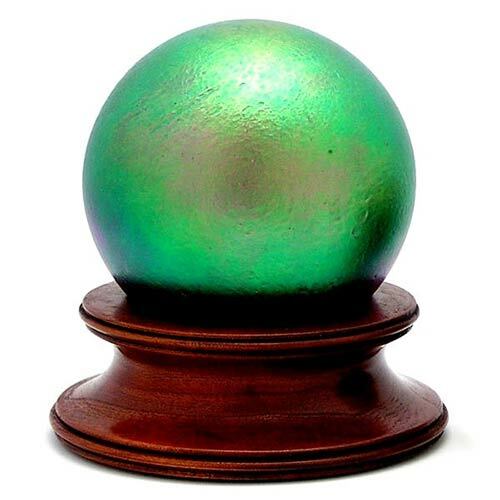 Hand-blown in a stunning green glass sphere, this small pet or keepsake urn is individually crafted in Canada but ships anywhere. The cherry wood base stand adds class, contrast, and stability, holding the spherical urn and highlighting the colors and craftsmanship. This urn comes in two sizes which hold up to 35 cubic inches of cremated remains. A simple circular ceramic vessel with rounded lid, the colors are in that sea-ocean realm between blue and green. Splashed with shades of coloration revealing white beneath (almost like the white-tipped waves at the seashore), this urn is quite literally marked with bubbles on its variegated surface. Holds 10 cubic inches, ideal for a small pet, for sharing among family members, or for holding a tiny amount of remains after a sea scattering. 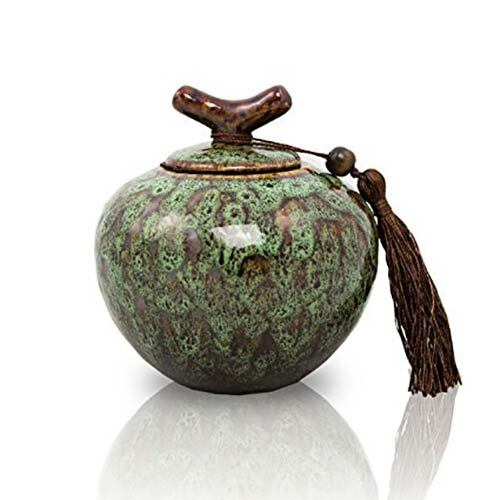 Mossy green patterns with a lovely strain of subtle browns make this a truly “earthy” pet cremation urn. Glazed ceramics inspired by vessels in the Asian art tradition. The lid is designed to look like a branch, and features a decorative matching brown tassel. Holds 20 cubic inches of cremated ashes. 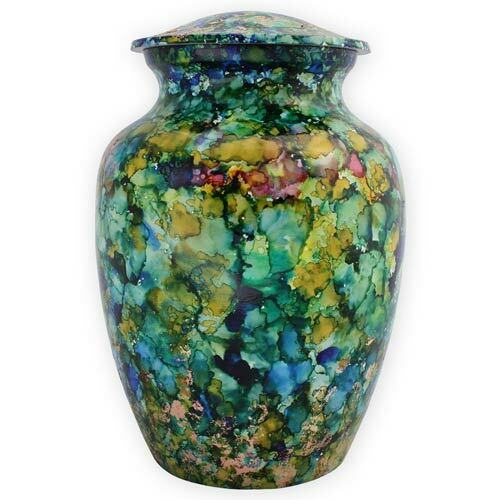 A colorfully hand-painted metal cremation urn, this “Kaleidoscope” urn features notable tones of green throughout along with blues, yellows, and hints of red and pink. The urn holds 40 cubic inches of remains, ideal for a pet or a portion of cremated remains from an adult. 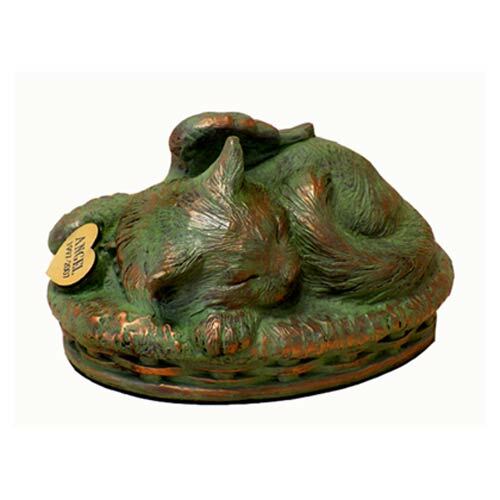 This cast bronze cremation urn for a cat is designed as an art piece, depicting your sleeping “angel” complete with angel wings. Holds a small amount of cremated remains (22 cubic inches) and you can optionally personalize the urn with an engraved heart tag. This one has a bronze “verdigris” finish that is tinted in green, mimicking the look of an ancient bronze statue. My cousin and his beloved died in a car crash this morning. His family wants to bring them together even up to their last moment. I will show this article to them as they might find it very useful in their current situation.